Classic Bride? Stylish with elegance & charm. 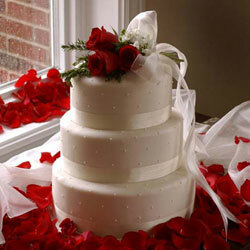 Your cake is simple, with sugar paste flowers, fresh or sugared fruit or fresh roses. Romantic Bride? Your fantasy cake will have whipped icing, sweet, light fillings, a garden of pastels, a touch of rose petals, or pearls and ribbons. Diva Bride? Drama & flair, colorful, shimmery, unique—a distinct taste that your guests will remember. Regardless of your personality, our staff will help you achieve your own piece de resistance. We combine the best ingredients and finest flavors to create the most incredible, mouth-watering cake extraordinaire. If you have a favorite flavor not listed, please ask our staff – we will do our best to accommodate you.